Today, we are comparing the Xiaomi Redmi Note 6 Pro with the Xiaomi Mi A2 to see which Xiaomi device offers better hardware on paper. The Xiaomi Redmi Note 6 Pro is going to launch on November 22 in India. The phone features a dual-camera setup at both front and back. The Xiaomi Redmi Note 6 Pro will also be the first smartphone by Xiaomi to come with MIUI 10. On the other hand, the Xiaomi Mi A2, which is a part of Google’s Android One program is one of the best devices available in the market under Rs 20,000. The smartphone is available on Amazon for Rs 15,999. 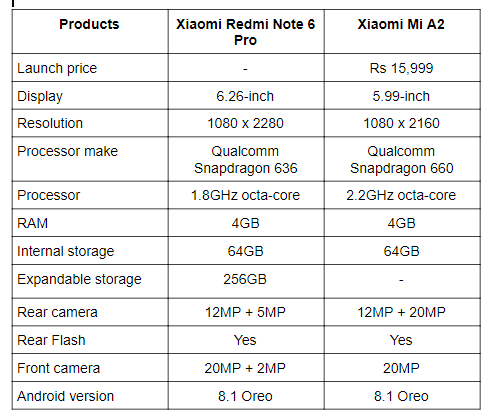 Let’s compare these two smartphones to see where the new Redmi Note 6 Pro stands in front of the Xiaomi Mi A2. Let’s start by comparing the display of these two smartphones. The Xiaomi Redmi Note 6 Pro comes with a 6.26-inch display that offers a resolution of 1080 x 2280 pixels. On the other hand, the Xiaomi Mi A2 sports a 5.99-inch display that offers a resolution of 1080 x 2160 pixels. The Xiaomi Redmi Note 6 Pro is ideal for those who spend most of their time watching videos on their smartphone. Coming to the processor, the Xiaomi Redmi Note 6 Pro is powered by a Qualcomm Snapdragon 636 processor, whereas Xiaomi Mi A2 is backed by Qualcomm Snapdragon 660 processor. As far as the cameras are concerned, if you’re looking for a smartphone that should have dual camera setup at both front and back then the Xiaomi Redmi Note 6 Pro might fit the bill. The smartphone comes with a dual 12MP + 5MP rear camera and dual 20MP + 2MP on the front. The Xiaomi Mi A2 has dual 12MP + 20MP rear camera along with a 20MP front shooter. 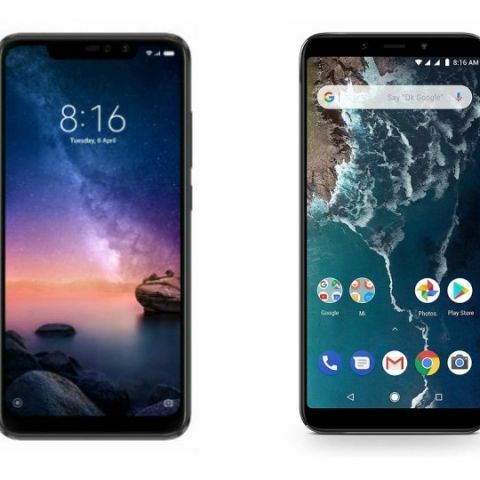 Before coming to any conclusion, one should keep in mind that the Xiaomi Mi A2 is a part of Google’s Android One program, which means it will be one of the first devices to receive updates from Google and sports a stock UI. IN fact, the phone is already getting the Android 9 Pie update. The Xiaomi Mi A2 is available for Rs 15,999 on Amazon. On the other hand, the Xiaomi Redmi Note 6 Pro will launch on November 22 in India, and the price has not yet been revealed by the company. You can expect it to launch at around the Rs 15,000 mark.